All Your Embargoes Are Belong To Us — especially now that the folks over at HummerGuy have gone live with the embargoed information on the Hummer HX Concept. The Hummer Warthog HX Concept will be blowing into Detroit Auto Show this weekend like it was fired out of a missile pod or something. Seriously, we cannot make enough Halo references for this thing. Now that Hummer Forums released photos of the new Hummer concept we can tell you this concept is smaller than the H3 and is powered by an E85 FlexFuel sipping 3.6L SIDI V-6 that moves all four wheels for traction. Exactly what you want when climbing over rocks or vanquished foes. Press release below the jump. DETROIT - With its unmistakable HUMMER design and a compact, go-anywhere driving ethic, the HUMMER HX concept challenges the hierarchy of the trail. HUMMER displayed the nimble, reconfigurable off-roader at the 2008 North American International Auto Show. 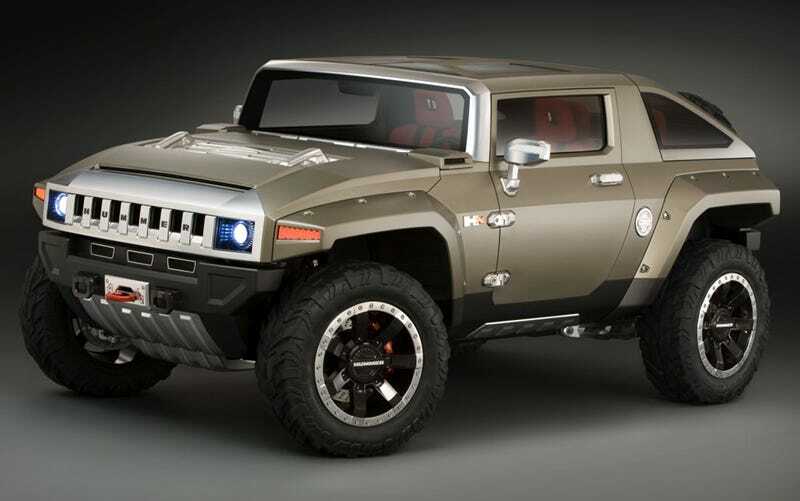 More compact than a HUMMER H3 - 81 inches (2,057 mm) wide, with a 103-inch wheelbase (2,616-mm) - the HX concept is an open-air, two-door off-road vehicle that packs the off-road acumen for which HUMMER has become legendary, along with an easily convertible body that acclimates to varied trail conditions, cargo needs or passenger whims. Its design is based on the ideas developed by a trio of young designers who are new to the HUMMER studio. "The HX is HUMMER's vision of an agile, trail-ready, open-air vehicle that fits the lifestyles of everyone who needs or wants to drive off road," said Martin Walsh, HUMMER general manager. "Of course, it carries exceptional off-road capability and the distinctive styling for which all HUMMERs are known." The HX offers an open-air driving experience via a pair of removable roof panels above the driver and front passenger, and a modular, removable rear roof assembly. With the roof panels and roof assembly removed, the HX is transformed into a true convertible. Easy removal of the roof panels and rear-roof assembly enables quick conversion from a closed vehicle to an open one. The HX also was designed with several roof assemblies, allowing this versatile vehicle to be configured as an SUT (with the roof assembly removed), a stylish slant-back or a traditional, wagon-like design that offers a bit more cargo space. "The modular design of the roof and removable body panels mark an evolution of HUMMER's design aesthetic," said Carl Zipfel, director of design. "These features demonstrate a deeper understanding of enthusiast desires when it comes to off-road driving - and the slant-back design gives the HX a look all its own." The design of the HX was driven by input from three young designers who were new to GM and the HUMMER design studio. As part of their "initiation," they were charged with developing concept drawings for a smaller, youthful HUMMER and the HX is a direct result of their creativity. The HX concept is based on one of the designers' original illustrations, but incorporates the best ideas and elements from the other designs. "HUMMER appeals to young people globally and served as a perfect first assignment for our newest talent," said Ed Welburn, vice president, Global Design. "Today's graduates from top design schools are ready to hit the ground running. The HUMMER design challenge gave our newest designers an opportunity to sprint." Inside and out, the HX carries a purposeful aesthetic that, from initial sketches to finalized clay models, was refined in only six months. "This is the HUMMER design language stripped down to its essence," said David Rojas, creative designer. "The HX has an aggressive appearance and great proportions, with beauty lying in its functional austerity." On the exterior, the lightweight theme is evidenced in the appearance of exposed, billet aluminum suspension components that feature CNC-machined lightening relieves, as well as clean, unadorned bodywork and minimal trim. The lightweight theme is taken to its extreme when the roof panels, roof assembly, fender flares and doors are removed. Classic HUMMER design cues make the HX instantly recognizable, including the round headlamps located in square housings, an upright windshield profile, minimal overhangs, hood vents and prominent air intakes. The air intakes are functional and feed a V-6 engine beneath the hood, while the hood vents are active - they articulate to allow hot underhood air to escape. And while the headlamps and grille are clearly HUMMER cues, they've evolved on the HX with a "chopped circle" motif. The grille slots and headlamps, as well as elements on the interior, have the appearance of circles or ovals that have been clipped at the top and bottom, creating a unique appearance that speaks to the vehicle's purposeful aesthetic. "The 'cut-off' circles suggest larger, heavy-duty components that were trimmed to fit the compact HX," said Rojas. And while it is unadorned by extraneous embellishments, the HX's exterior is nonetheless outfitted with features that speak to HUMMER's legacy of technology and innovation, including HID headlamps with focusing rings that adjust automatically when they're turned on - much like the lens of an auto-focus SLR-type camera. LED technology is used for the front turn signal lamps and taillamps. From aircraft-inspired seats to integrated, off-road-ready tools, the HUMMER HX's interior has a beauty that lies in its purposeful intent. It was inspired by the functional and lightweight elements found in aircraft. "Aeronautical parts are designed to be both lightweight and strong, and that is the feeling exuded by the HX's cabin," said Stuart Norris, interior design manager. "There isn't superfluous trim or decoration - it is a purposeful design that conveys beauty through strength." Reinforcing the stripped-to-the-essence feel, the exterior's matte olive color carries over onto the interior's largely sheet metal-covered panels. The color is accented with pressed or extruded aluminum components, such as the handles, switches and other necessary parts. Furthering the aeronautical influence is the instrument panel, which uses an exposed, extruded aluminum cross-vehicle beam as its foundation. On the beam, the instrument cluster and other vital controls are mounted; and it also features a unique, removal top cover that provides significant storage capability. "The instrument panel is a styling element of the HX, and the removal of the top cover reveals a secondary design that enhances the vehicle's core design ethic," said Norris. "With the top cover removed, the interior conveys even more of a basic essence - and the structure beneath the cover is beautiful to those who appreciate finely crafted metal." A rubberized floor and ballistic nylon-material covering on the instrument panel and other interior components reinforces the functional aesthetic. Like aircraft seats, the HX's seats are constructed on a lightweight framework with minimal components that feature lightening holes and strength-enhancing cross braces or triangulations. They are mounted on exposed, aircraft-style tracks and trimmed with a weather-resistant neoprene material. The HX seats four, with a pair of bucket-type seats in the second row. The rear seats mimic the front seats' design and can be removed to generate more cargo room. All the seats feature a four-point, racing-style safety harness. The inner seat track on both front seats is located beneath the outer edges of a prominent center console. The console offers exceptional storage capability and houses a unique shifter that mounts low and out of the way when the vehicle is parked - also hiding from sight the engine starter button. It has a spring-loaded cover that pops up when the driver is ready to select a gear. The console also houses a resting place for phones, MP3 player and iPods or iPhones. In fact, there is no conventional radio in the HX, only integrated speakers. Passengers plug in an iPod, or similar device, to a USB connector to play music in the HX. "From the console to the cargo area behind the seats, there are simply untold storage possibilities within the HX," said Norris. "It's like a four-wheel backpack that's already fitted with the necessities." The "cut-off circles" motif of the exterior is seen even more so on the HX's interior, as the gauge cluster, instrument panel vents and even the steering wheel carry the design element. A three-element gauge cluster - each of the three instrument "pods" carries the cut-off circle design - delivers crucial driver information in either a highway or off-road mode. This conceptual reconfigurable gauge layout uses LCD screens with multiple layouts, including a navigation system. The nav system features GPS and compass information; and is designed to upload trail information before setting off on an excursion. The center gauge pod houses a speedometer and tachometer, but changes to a wheel angle indicator when the transmission is in the low position. This off-road mode changeover from the highway mode gives the driver information that is more pertinent to the driver conditions. The trail view of a camera mounted in the rear-view mirror can be displayed on the instrument panel, too. The off-road mode features of the instrument panel comprise the virtual tools of the HX, while others are mounted for physical use, including a folding shovel, flashlight and first-aid kit. They all carry the "clipped circle" design motif found throughout the vehicle. With its compact dimensions, almost no overhangs and grippy 35-inch tires, the HX is ready for all terrains. Like all HUMMER production models, the HX has sturdy, body-on-frame construction, onto which is mounted front and rear independent suspensions. The front suspension features an electronic-disconnecting stabilizer bar for enhanced maneuverability when driving off road, and the rear suspension is located with Computer Numerical Controlled (CNC)-machined, billet trailing arms. Heavy-duty shocks with piggyback reservoirs were custom-made for the HX by renowned racing shock manufacturer Fox; one is mounted at each wheel position. A full-time 4WD system pulls the HX over, through and around off-road obstacles. It transfers torque to the front and rear axles, each of which is equipped with a locking differential. The torque meets the trail via custom 35-inch-tall off-road tires that are mounted on a set of custom, bead-lock-style wheels that have a two-tone appearance; dark-painted wheel centers complemented by silver-anodized outer rims. A complete underbody armor kit, including a front skid plate, powetrain protection and more, protects the HX from wayward rocks and other potentially damaging objects. A power-operated winch is located in the front bumper, and the HX has recovery hooks mounted on the front and rear bumpers, just in case its help is required for wrangling others out of unfortunate off-road situations.